Bishop David Rice was formerly the Diocesan Bishop in the Diocese of Waiapu in the Anglican Church in Aotearoa/New Zealand and Polynesia. The inclusive emphasis of both dioceses and the focus on “missional ministry” are included in the fascinating list of similarities which these dioceses share. 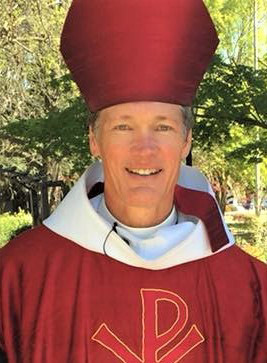 Bishop Rice was elected by the Diocese of San Joaquin in March of 2017. He assumed leadership after the dioceses had been through 10 years of litigation. This came after a former bishop had led an effort to split the dioceses from the Episcopal Church over issues of women’s ordination, homosexuality and church doctrine. David is a strong “ecumenist” and has a history of exploring ways in which the church can be far more collaborative and collegial across denominations and faiths. David also has a heart for social justice ministry and continues to seek ways in which church can join with all of God’s People where ever they are. David has a M. Div from Duke Divinity School, Duke University and a B.A. from Lenoir Rhyne University, both in North Carolina. Internationally honored hymn and song writers, worship leaders and concert artists, Jim & Jean Strathdee share the power and sensitivity of their music with thousands of people each year. Their songs are a musical offering of hope and encouragement for all people, bringing a message of compassion, justice and healing and caring for the earth. The Strathdees have a special gift for encouraging people to sing with them. Much of the music they write and perform is designed for congregational song. They also love to work with local singers to create a choir for their events. The Strathdees travel widely doing concerts, leading worship celebrations, workshops and retreats. They also serve as worship, song and choral leaders for many conference events. Their work expresses a wide range of musical moods ~ joyful, playful, prayerful and always heartfelt. It spans a diversity of sound and style including traditional, folk, rock, jazz, and international flavors ~ animated with guitar, piano, mandolin, harmonica, African drums, and Native American flute. Seeing music as an agent of personal and social transformation, Jim & Jean are involved in fund and consciousness-raising projects, events and rallies where ecumenical and inter-faith communities come together to make a stand for positive change. They maintain a relationship with many Christian communities throughout the US and Canada, Central America, India, Jerusalem and occupied Palestine where they’ve had the privilege to travel and sing. 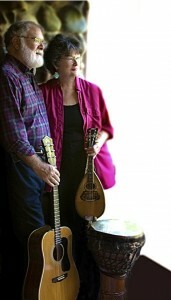 Over the years Jim and Jean have served as music directors in United Methodist congregations in California and Hawaii. Their music is published in dozens of songbooks, curriculum projects, denominational hymnbooks and supplements and is sung on six continents. They have written hundreds of hymns, songs and anthems and recorded nearly 20 albums. For more information go to www.strathdeemusic.com. First Time Attendees! – Special $100 per person rate. Copyright by the Ecumenical Retreat for Retired Clergy, Church Professionals and their Partners, all rights reserved.